Botanic Gardens Restaurant, Adelaide, South Australia. Information, Photos and Reviews. The Botanic Gardens Restaurant offers spectacular 180 degree views of the gardens and pond within a tranquil botanical setting. Acclaimed head chef Paul Baker's menu is modern Australian, featuring ethically farmed South Australian produce, fresh vegetables and herbs harvested daily from the nearby Botanic Gardens kitchen garden, he has made a clear effort to minimise food miles traveled in that true “kitchen garden to restaurant table” mentality. An innovative beverage list of local; national and international wines, beers and botanical inspired cocktails and knowledgeable wait staff complete the whole dining experience. The Himalayan Kitchen - North Adelaide (0.5 miles) - Nepalese and Tibetan family owned and run restaurant. 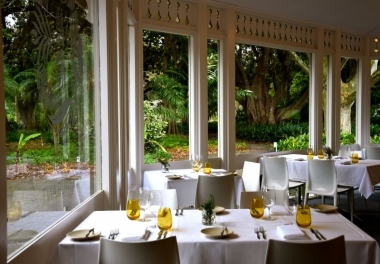 Nobody has reviewed Botanic Gardens Restaurant yet, Be the first. You are submitting a booking enquiry. Botanic Gardens Restaurant will then contact you by email with details of availability and prices.